So last time I wrote I had my head in the sand in Goa. Had a good week there just enjoying the postcard perfect views over the Arabian Sea, I spent the first day or two in a brick hotel up the road from the sea but Tino saw my bike, left me a note and so I moved to the beach huts he and Philip were staying in. I had breakfast every morning with a view through some palm trees onto the ocean and I would wake myself up each day with a swim in the warm waters. The rest of the day was spent just chatting, playing cards, drinking and the odd game of chess. Not something you could do forever but it was a good week. Philip picked up an infection in his leg which had to be cut out so he had been in Goa for almost a month and so was pretty happy when the doc told him he could leave and we headed towards Hampi. Phillip travelled with two girls we met from England and Australia and me and Tino hit the road on the bikes and headed for some waterfalls in Goa. We planned to take two days getting to Hampi. We left at about 2pm and rode the short distance to the waterfalls with Tino leading the way we unsurprisingly ended up riding alongside a railway track which my bike could hardly fit along and I was thankful when we finally left the track until I saw what we left it for. It went under a small bridge, there was a dried riverbed and then the track was blocked by a fallen tree. 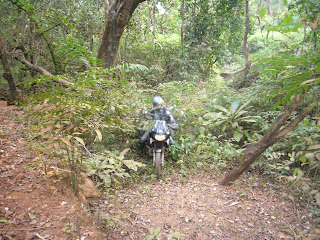 We had to negotiate our way through the forest to find the track again. 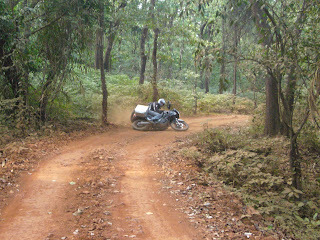 Eventually we found a more reasonable road, no tarmac but good riding for my bike. I got some two wheeled air for the first time and had a blast along the road. There was no traffic and it dipped, curved and rocked everyway you can imagine. The waterfalls were huge, falling in two sections with a railway bridge cutting it in half. We stayed for a bit enjoying the sounds of the water and wildlife, watched a train pass and headed back to the bikes. We had planned to camp but decided it was unsafe so headed towards Molem for the night. On the way back we passed through two river crossings. Tino in his usual style blasted straight through the first one... Well.... Halfway through before his engine cut out. I took a couple of photos before helping him push the bike out of the water. My boots filled up in seconds. I passed through very slowely and then we tried to get Tinos bike running again. After about 30 minutes everything was going again and so we carried on and came across a roadblock which was difficult to circumvent but we found a way. We passed through the next crossing slightly slower and reached a hotel. It is days like that day that really make this trip, when I am doing that kind of thing I think it is all I would ever need. That I could do it forever and not get bored. It's hard to think about the next day. Certain things are a blur, actually most of the trip is. At one point I remember thinking Tino missed the exit we needed but didn't bother telling him and I remember following his taillight like it was my only lifeline. Most of the time I thought about only one thing. In the morning, about half an hour after we left the hotel with still soaking wet boots we reached a difficult section of road. Lots of trucks, corners and potholes. Nothing unusual for India but afterwards Tino said he felt like something bad was going to happen that day. I don't really remember the crash. Well I do but not the usual way you remember things. I remember seeing the truck but not how I reacted to seeing it. I also remember it hitting my shoulder. I remember standing in the road staring at my bike leaking petrol on the road and at my entire life scattered next to it. Anything apart from that is guesswork. I know the truck ran over the front of my bike probably with its rear wheels and I know that it ripped one of the panniers clean off my bike with chunks of aluminium sheared out of it like tinfoil. I did the only thing I could do. I checked myself for injury and with the motto if it hurts it works I got my bike off the road and collected my stuff. By the time Tino got back I was already banging the box back into shape and asked him to look at the bike. It is... She is rideable but hard for me to look at. 22,000 km and almost 6 months on the road. I've bonded with that bike and now... Well it's just hard. And me? Well what do you want me to say? I could have gone under the truck? Sure. 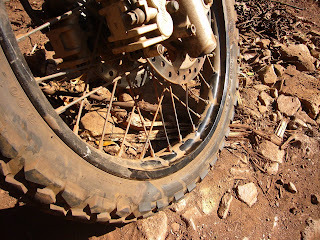 If I didn't have crashbars and panniers the truck could have easily taken my leg? Well yeah but it didn't and all I have to show for it all is a bit of pain in my arm. I refuse to think about anything else. I just can't. Not yet. The pannier took the bulk of the first hit and is showing it. It is definatly no longer waterproof. The truck ran over the front wheel of the bike bending it and one of the brake disks out of shape. The crashbars took the biggest hit and have split in two. We removed the disk and rode 200km to Gadag. As I said before I just followed Tino. It had taken everything to put my bike back together and to get back on it. Well almost. The ride went in a blur. I was completely detached from my riding and was concentrating on the pain and stopping the wobble in the handlebars which was constant. I kept on waking up that night in Gadag not having nightmares just not sleeping well. The next day we left to do the 100km to Hampi which should have been an easy ride and it was until we reached Hospet. I was still blindly following Tino and in hindsight that was a bad idea. We were in Hospet for maybe 10 minutes before it happened. I think about my own grandparents when I think of this and it makes it hard. I hit an old lady. I can't say how or why except that, even though the broken brakes and damaged wheel added to it, I know it was my fault. Thinking even less now I rode the bike through oncoming traffic and skidded to a stop dropping the bike. I ran towards her and she was just this old lady lying in the road not moving. She had been carrying red dye powder which was scattered on the road around her, I will never forget that image. I guess I thought she was dead then people started to help her up. She was walking. I want to say I stayed and took her to hospital but I tried to run, I reached my bike but someone took my keys. I kept hold of them but got off the bike. This was it. I was beaten. I think there I accepted that it was out of my hands now and I could only try to keep my head above water. I went to the hospital with her and the guy said it was ok to move my bike somewhere safer. I jumped on my bike and legged it. I have seen people beaten by the side of the road for causing accidents. It only takes one person to throw a stone and the mob mentality takes over, I didn't want that to be me so we ran with people yelling behind us. We got about 1km down the road before the police stopped us and took us to the police station. I guess this is where I really gave up. I believed that I was going to jail and it almost seemed a relief. I told Tino if it happened he had to go to see Phillip and let him know what is going on before coming back to see me. We sat there for an hour or two answering questions and filling in forms. Eventually the top brass came along and we spoke. He said that If I admit fault I would have to pay a fine and no more action would be taken against me. I asked how much and when he said 300Rs I almost laughed. That's about $6. I would go back and check the lady was ok, I would also give her some money but it isn't safe and I dont want to push things. I hope she is ok, the police said she was but I wont ever know for sure. My life? That's an acceptable risk for this trip but someone elses? I didn't even consider it. I have never thought I could be responsible for someones death and I don't know how to feel about it now. It still doesn't feel quite real. Great story and beautiful pictures.